Dentistry is advancing rapidly, and new technology is making care more comfortable and efficient than ever. At Pelican Landing Dental, your general and cosmetic dentist in Bonita Springs has outfitted our office with modern equipment to improve your dental experience. With an intraoral camera, digital X-rays, and our cone beam CT scanner, we are offering better care for all our patients! That makes a difference whether you’re just here for a regular checkup and cleaning, or if you need something a little more complex — like porcelain veneers, dental implants, or periodontal therapy. Before we get started on any restorative or cosmetic treatment plan, our team wants to make sure you fully understand what we propose, and why. It’s much easier to effectively communicate your potential treatment plan with the intraoral camera. 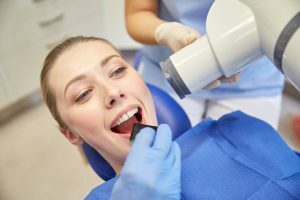 It’s a wand-like tool that your dentist or hygienist runs around the treatment area to transmit crystal clear images onto a screen that’s located right at your chairside. A picture really is worth a thousand words in dentistry — and our small handheld mirrors only tell half the story. Our patients find it much easier to ask the right questions when they can easily see what’s going on inside their mouths. X-rays are a crucial diagnostic tool for any dental office, and most patients need to have X-rays taken at least annually. Unfortunately, traditional radiography takes a considerable amount of time, requires space for storage and development, and exposes you and your family to unnecessary levels of radiation. Digital X-rays offer a better alternative! Captured and ready for viewing in mere seconds, this method of looking at your teeth and oral structures reduces the total amount of time you spend in the dental chair. And because the files are stored digitally, we don’t have to dedicate any of our office space to keeping up with them. Digital X-rays also expose patients to up to 80% less radiation compared to traditional radiography. Treatment planning for more advanced procedures, like dental implants or bone augmentation, requires an in-depth image of your oral structures. It’s something a simple X-ray just can’t provide. The cone beam CT scanner is much like a traditional CT scan, but it uses a special type of beam to capture the neural pathways, bones, and blood vessels in and around your oral cavity. With this advanced equipment located right here in our office, your dentist has all the information needed to provide even the most advanced procedures with the utmost success. You Can Benefit From Modern Dental Care! Does your current dentist make the most out of all that modern dentistry has to offer? If not, it’s time to visit the Bonita Springs dentist at Pelican Landing Dental for your general, restorative, and cosmetic dental needs. We can’t wait to welcome you into our modern dental practice! Contact our office or request an appointment online today.